Troy Bumagat had his plans for early retirement from the Philippine Navy all laid out. In 2010, three years before he planned to leave his post as Navy captain, the Philippine Military Academy (PMA) graduate bought a four-hectare agricultural lot in Kananga, Leyte and named it Trophy Farms. Initially, it was a weekend place for his family where he can teach his kids the value of farming. “They now have the appreciation where food was coming from. That was the main idea,” Bumagat, now only 43, explained. Ahead of his retirement, he worked on an existing small rice field and ventured into vermiculture, or the cultivation of earthworms, broiler chicken growing and planting of high-value crops. “I was simply thinking of trying agri-produce that I can raise or grow in the most efficient and productive manner,” he recalled. But a few months after he finally retired in 2013, Typhoon Yolanda hit Leyte and nearby islands in November that year, wiping out all that Bumagat worked hard to build. “Everything we invested since 2010 were all destroyed, and this was only months after I officially retired from the Navy,” he shared. Rather than give up, Bumagat soldiered on, pushing through with his plans to expand the farm. Armed with his family’s small savings and his retirement money, along with the soft loans from a government bank, he increased the capacity of his poultry farm and ventured into the logistics of livestock. “We are in an island region, and I thought if I will master logistics, the movement of our farm produce will have a great boost. I was right. I thought that if and when I will succeed in creating and selling fresh produce, I need to move it fast and efficient,” said Bumagat. Despite the challenges of rebuilding a business in the aftermath of the widespread destruction caused by Typhoon Yolanda, the former Navy captain succeeded not only in rehabilitating his farm but in growing its operations. Along the way, he even managed to win recognition from the Department of Science and Technology, which gave him a National Champion for Best Small Enterprise Technology Upgrade Award for Food Production in 2016. He gathered some of the wild mushrooms and brought them to Renato Reyes, vice-president for external affairs at Central Luzon State University and an expert on mycology, or the study of fungi, of which mushrooms are perhaps the most well-known variety. Seeing the potential of the mushrooms, the specialist offered to help in domesticating the mushrooms for commercial production, which entailed a lot of experimentation. Greatly encouraged, Bumagat visited mushroom farms in Luzon to learn what varieties can be grown commercially. “I learned that Leyte possesses one of the best, if not the best, ingredients for mushrooms farming,” he said. 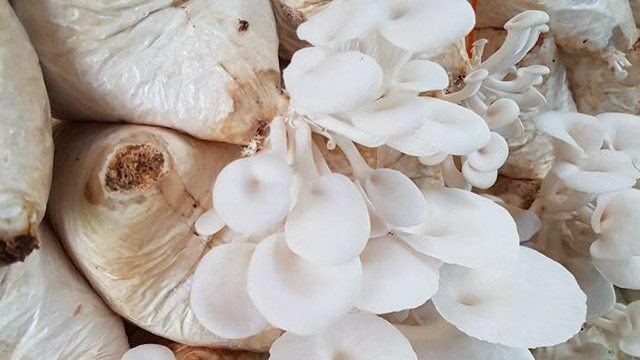 He began his experiments with growing different mushroom varieties and decided to produce Brown and White Oyster, Tenggang Daga, Milky and Collybia mushrooms. 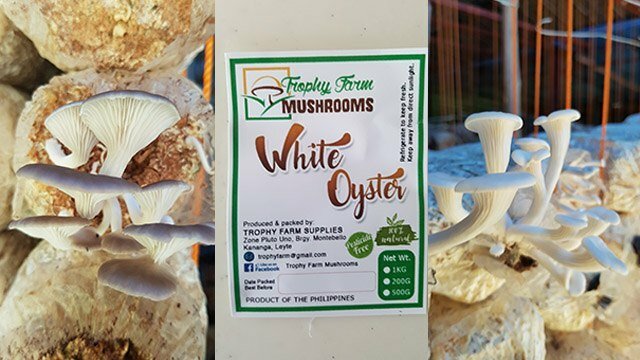 By November, Bumagat already started harvesting his mushrooms, prompting him to scale up production by investing roughly Php800,000 for lab tests, inoculation facility and purchase of equipment. It’s not surprising that Bumagat readily took to mushroom growing. In 1988, when he was only 14 years old, he was introduced to the fascinating world of mushrooms by no less than Dr. Reyes. He accompanied his mother who was conducting some experiments for her master’s degree thesis in food technology and got to meet Dr. Reyes. When he joined a science fair, his winning entry was an experiment on the efficacy of various agro-industrial waste materials as spawn substrate for mushrooms. “That early I knew that the work I’m putting will have a lot of potential in the future,” Bumagat said. Because of his early interest and familiarity with mushrooms, it didn’t come as a big surprise that Bumagat’s experiments turned out very well. In less than three months, the mushroom farm was producing an average of 100 kilograms per week. “We were scaling up and targeting the Cebu market. The idea was to sell it in restaurants in all the cities in Region 7 (Central Visayas). For several weeks, I sold to every friend in every city, but the mushroom kept on producing," he said. 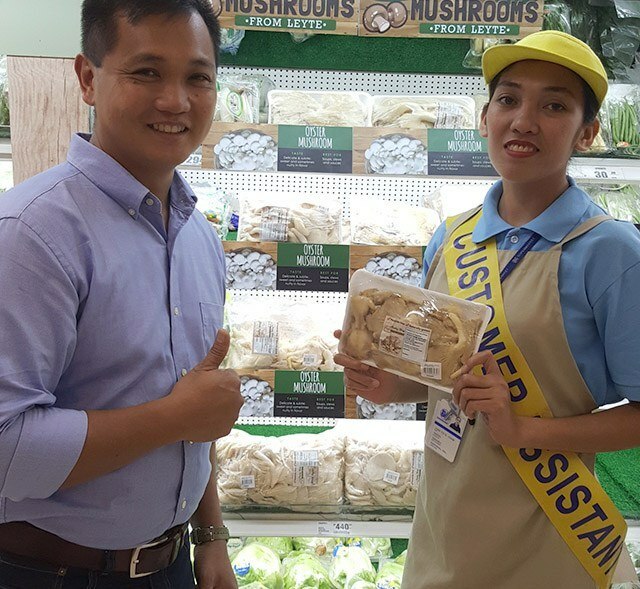 His participation in the Department of Trade and Investments (DTI) and Go Negosyo’s Mentor Me program for microentrepreneurs paved the way for Bumagat to sell his white oyster mushrooms to a major retailer, SM supermarkets in Cebu and other cities in the Visayas. “They (the DTI) guided almost every day and provided very concrete assistance like added ads and customer assistance to push the products. Other friends in the program are also providing me with sound advice on market linkage and branding," he said. Trophy Farms now produces an average of 200-300 kilos of oyster mushrooms a week. He sells 30 to 40 percent of his output to SM supermarkets in Tacloban and Cebu cities. The rest are either sold to various restaurants in Cebu or converted to other products such as chicharon, jam, patties, and atsara. 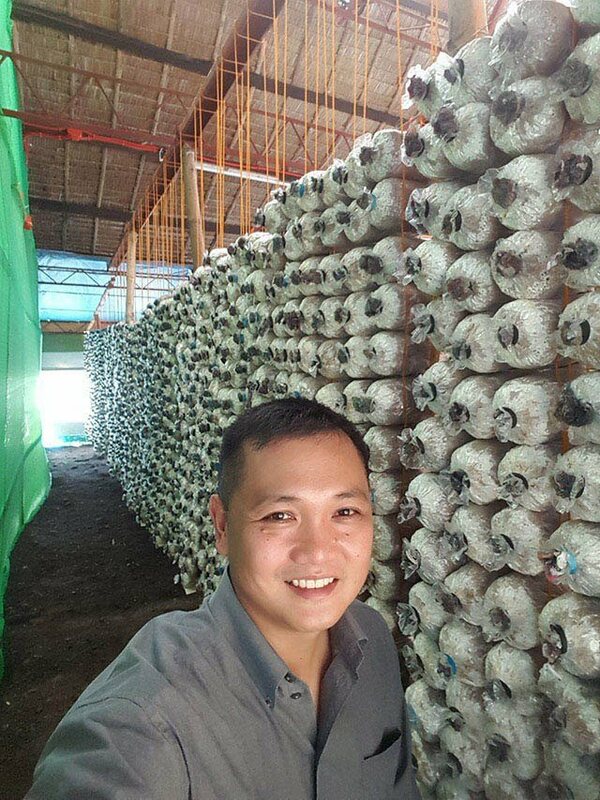 These days, Bumagat is busy growing fresh straw and button mushroom, which he intends to supply soon also to SM supermarkets. “Mushroom is fascinating; my hope is for fresh mushrooms to become affordable,” he said. Selling for Php440 per kilo, Bumagat easily grosses between Php88,000 and Php132,000 a week based on his weekly output of 200 kilos to 300 kilos of oyster mushroom. Annually, that amounts to between Php4.6 million and Php6.9 million in potential gross revenues. And to think that Bumagat discovered the business almost by accident when he found the wild mushrooms under his papaya trees. Indeed, business opportunities sometimes seem to appear out of nowhere – like mushrooms. A magnitude 6.5 earthquake struck Leyte on July 6, hitting Kananga town, where a three-story commercial building collapsed, trapping people inside. So far, there had only been reports of few fatalities in the entire province, unlike when Typhoon Yolanda hit in 2013 and killed thousands. Bumagat was also luckier this time. A couple of his poultry buildings and fruiting houses for mushrooms sustained only minor damages. In 2013, most of his farm’s structures collapsed and he lost all his crops. So far, Trophy Farms’s prospects continue to be bright and Bumagat can only hope it remains so. Cherrie Regalado is a contributor to Entrepreneur Philippines.